CinemaTechnic, LLC of Burbank, CA offers factory trained and authorized repair and maintenance service for professional cine lenses manufacured by Angenieux, ARRI, Canon (CN-E lenses only), Cooke Optics, Leica (CW Sonderoptic), P+S Technik and Zeiss (cine lenses branded Carl Zeiss or ARRI/Zeiss). Other manufacturer’s lenses or discontinued lenses may be supported on a limited basis. Examples include vintage Angenieux, Cooke and West German Zeiss lenses, Dalsa 4k Digital Cinema lenses. Any lenses manufactured in the former Soviet Bloc of countries, including but not limited to the Soviet Union, East Germany. Brands include LOMO, Zenit, Carl Zeiss Jena. Still-camera lenses, (SLR or rangefinder) including Zeiss ZE, ZF, etc (Zeiss exception due to spare parts unavailability). 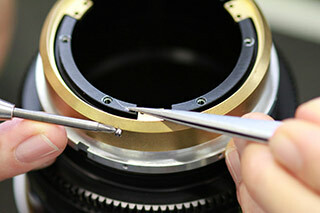 We may be able to fit focus gears to these lenses but no internal service is possible. Any lens built into a camera, regardless of brand. We cannot provide any recommendations for service of the above lenses. Master cine lens technician Jorge Diaz-Amador has over 19 years experience servicing cine lenses and is trained by Zeiss at the Level 4+ Authorized Service Partner level, the highest level of service training available outside of direct Zeiss employment. 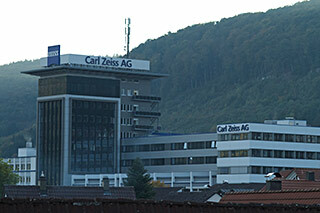 He has spent nearly 3 weeks of training time at Carl Zeiss headquarters in Oberkochen, Germany, plus an additional week of training in Los Angeles each year for several years. 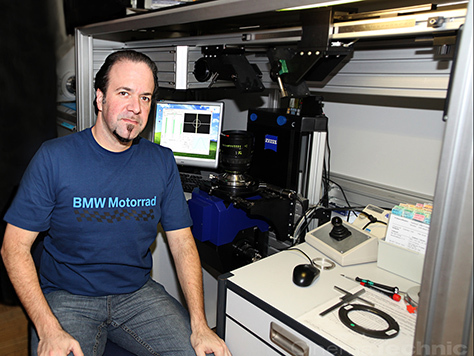 Jorge has also trained at Cooke Optics, Leicester England and has received factory technician training from Thales-Angenieux and Canon USA (CN-E cine products only) in the U.S.
For over five years, Jorge was the lead optical service technician at the Carl Zeiss Authorized Service Center in Burbank, CA. 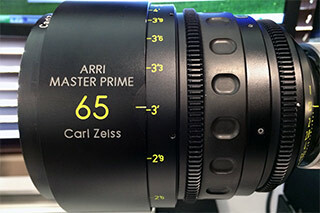 For a time he was the only technician in the U.S. authorized to do warranty repairs on new Master Prime lenses. 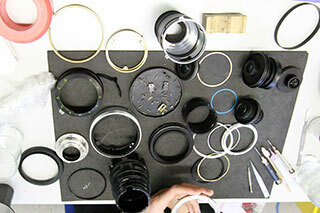 He has performed repairs on every type of Zeiss cine lens mentioned on this page. Prior to that, Jorge operated the original CinemaTechnic, Inc. in Miami, FL and began servicing cine lenses in 1998. CinemaTechnic is equipped with all the proper tools to properly service cine lenses, including the special lens manufacturer’s service tools and lubricants, a laminar flow clean-air enclosure with static control for assembly. A Moeller-Wedel collimator and P+S Technik/Kish Optics lens test projector for calibration. We also have custom-designed tools and fixtures to aid in our work. The most common replacement parts like shims, fasteners and cam followers are kept in stock. 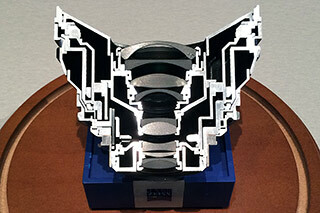 New replacement parts are available for most lenses made within the last 20 years. We can also recondition lens elements that have suffered glass scratches or abraded anti-reflective coatings. This service is particularly important for older series lenses when new replacement lens elements are not available from Zeiss (see below for a list of discontinued parts). Labor rate for standard service is $150.- per hour with a one-hour minimum service. Standard service usually requires a 3 business day minimum time in shop if replacement parts beyond stock-on-hand are not needed. Shorter turn-around times are possible. It is sometimes possible to do repairs in 24 hours, if arrangements are made. But due to the nature of complex lens service, delivery times regrettably cannot be guaranteed. The most common replacement parts (for example: focus adjustment shims, screws, cam followers) as well as manufacturer approved lubricants and adhesives are kept in stock. 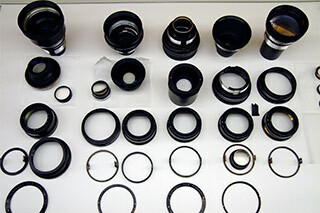 Other needed replacement parts are sourced directly from the lens manufacturers. If replacement parts are needed, expect a minimum delay of 10 days for parts since all of the supported manufacturers are outside the U.S., and shipping/customs delays are common. Some manufacturers are maintaining parts stock in the U.S. (Canon USA and Cooke for example) so the delay may be less for some lenses. Please keep in mind that repair parts for many older lenses are in short supply. Generally if your lenses are more than 20 years old, you should expect difficulty in sourcing spare parts. Parts for lenses 30 or more years old are generally unavailable from the manufacturer. Canon: K35 primes and zoom, Super 16 format zooms. 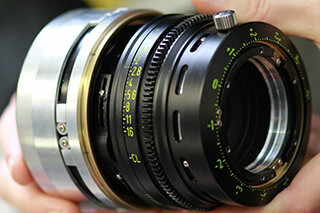 Cooke: Original Panchro, Speed Panchro, 9-50mm, 10.4-60mm, 20-100mm, 25-250mm Mk. I, Mk. II. If you need service for a lens for which parts are discontinued and you need a part, we will do our best to locate the needed parts for you. New replacement parts are charged as an additional cost, but you will normally not be charged for the shipping of the parts. Expedited service offers a guaranteed delivery date, which will be mutually agreed upon between us, and you will be charged for the expedited shipping of replacement parts. Shipping costs for parts may also be incurred for discontinued lens parts. All CinemaTechnic lens repairs will be covered by a 6 month limited service agreement for optical repairs. All warranty repairs need to be scheduled at least 5 business days in advance. You will be responsible for shipping to and from us. Also, you will be entitled to free focus checks during this period, provided you handle getting your lens to/from our shop. We require that you contact us in advance to schedule a free check of your lenses. We recommend doing this before the start of any major project. In some cases, we can have scratched lens elements polished and re-coated if new lens elements are not available. Please be aware that there is always considerable turn around time (several weeks) for lens element re-coating. This service is competitively priced for smaller single lens elements. For large elements and especially cemented doublets, it only makes sense if replacement elements are unavailable and the lens is valuable. CinemaTechnic can service lenses that are difficult to find service for. 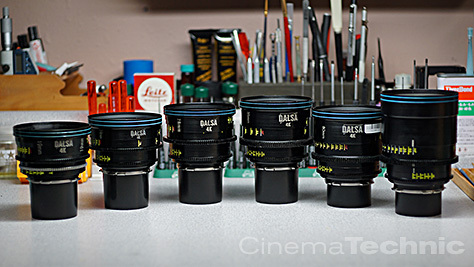 We are the only shop experienced in the service of the very rare Dalsa 4k Digital Cinema lenses, for example. 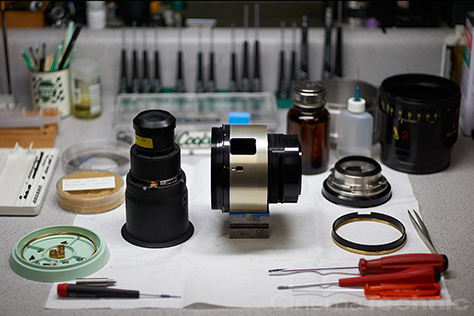 Service is also available for the Zenit Optar Illumina Super 16 lenses. Service for 35mm Illumina lenses made by LOMO is planned for the future. The back or front focus of the lens is not set for optimum focus. Even using collimators can result in incorrect back focus if the instrument is not properly calibrated, or is not properly used. The flange focal distance (FFD) of the camera is not set properly. This can be difficult to set accurately on digital cinema cameras. 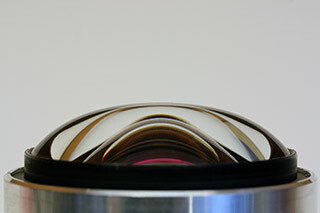 The best method for digital cinema cameras is to use a special test lens on an autocollimator. 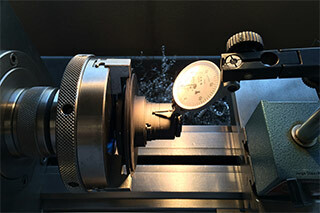 Film cameras can be checked with specialized gages. On film cameras, a slight negative tolerance must be maintained since the film will never sit perfectly flat in the aperture. On film cameras, if the ground glass (or fiber optic viewing screen) is not set to match the film focus. This is a very critical adjustment that is done using a method similar to the one described above for setting FFD on digital cine cameras. If your lenses do not “come up on the marks” after we have adjusted the back focus, your camera needs to be checked for proper FFD setting. We can perform this service. Please contact us for more information via e-mail. All text and photos ©2007-2018 CinemaTechnic and Jorge Diaz-Amador. All text, images and other content on this site are original copyrighted works. CinemaTechnic and Jorge Diaz-Amador own exclusive rights to this content under the United States Copyright Act of 1976. Unauthorized use and/or duplication of this material without express and written permission from this website’s author and owner is strictly prohibited.